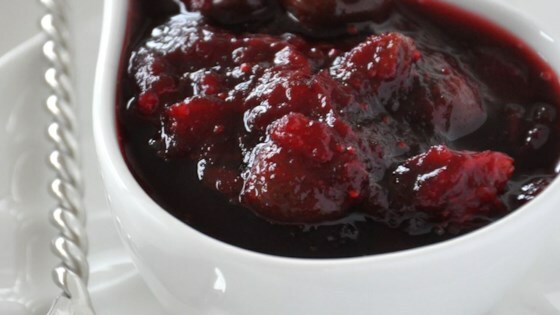 "This is a wonderful cranberry sauce that I make every Thanksgiving." Stir the cranberry juice cocktail, water, brown sugar, cinnamon stick, and allspice together in a saucepan; bring to a boil. Add the cherries to the cranberry juice mixture; cook another 2 minutes. Add the cranberries; continue cooking, stirring occasionally, until the cranberries pop, about 10 minutes. Remove from heat and chill in refrigerator 8 hours to overnight. Remove and discard cinnamon stick before serving. I added a little orange zest! Delicious.